Morrinsville writer Vaughan Rapatahana is a former Kerikeri High School teacher – and a Hong Kong writer, and a scholar who’s lived in the Philippines, and a poet published in France, and a writer for a Pennsylvania literary journal. Brunei Darussalam, P.R. China, UAE and Nauru are in his CV, too… yeah, Vaughan gets around. Just get him started talking about his novel Toa, for instance (published in 2013). Vaughan’s words seem to appear all around the world, and he travels as much as he can. If you have an interest in Kiwi creative writing, you’ve probably seen Vaughan Rapatahana’s name across dozens of publications, including his just-released novel called, er, Novel. Born in 1953 in Patea, Vaughan, who is of Te Ātiawa and Ngāti Te Whiti ancestry, wrote a bit during the 1970s and 1980s, had a lull during the 90s, and returned with oodles of energy ten years ago. Since then, he’s been publishing poetry, academic text and fiction non-stop. Amongst other achievements, Vaughan has won the Proverse Poetry Prize, his poetry collection Atonement was nominated for a National Book Award in Philippines, and his writing has been published in French, Tagalog and te reo Māori. His poem Rangiaowhia has been shortlisted for the NZSA Canterbury Heritage Book and Writing Awards 2018. One of his proudest publications is 2012’s English Language as Hydra: Its Impacts on Non-English Language Cultures. In between the Novel launch, the exhaustive appeal for reviews of Novel and working as a resource teacher, Vaughan has also been editing Ngā Kupu Waikato, a collection of Waikato poetry and has been contracted to write a third Poetry in Multicultural Oceania collection. Money and time are restrictions for writers like Vaughan, which is why family are helpful. His daughter Pauline Canlas Wu – a tattoo artist in Hong Kong – illustrated Novel, while wife Leticia Canlas helps too. Vaughan takes a break from his day job for this interview, explaining that he is looking forward to retiring after November. It was 1977-79 when the then-24 year old taught in Kerikeri. Typical of Vaughan, he didn’t stay put for long. “That was after a year in the meatworks at Southdown, in between university and training college.” Vaughan recalls Kerikeri as, “a fairly Pākehā district.” He returned to live in Pakaraka and then Awarua, after working in Nauru. At the time, Vaughan wasn’t aware of a nascent literary scene in Northland. “If there was stuff going on, I wasn’t much aware of it. I was starting to write myself. I got a couple of stories published in the NZ PPTA Journal. Talk of the popular poet gets Vaughan namedropping contemporaries who have made a mark in NZ literature – fair enough considering Vaughan has been inside schools, universities and workplaces with David Eggleton, Roger Horrocks and James Norcliffe, and now sees a lot of fellow Waikato poet, Bob Orr. Vaughan says he is ‘ever the Outsider’ – a reference to the seminal book by Colin Wilson, whose literature Vaughan studied for his Ph.D. Check out Vaughan’s fascinating work via the links below. Writers Up North has one copy of Novel and one copy of poetry book ternion to give away. To win your copy head to Facebook @WritersUpNorth and post a rhyming quatrain about why you would like to win (and review) these books. Wild Side Publishing generously stepped in to help pay for Write Up North’s domain hosting for the 2018-19 year. Check out the catalogue and website of this up-and-coming Christian, memoir and inspirational publisher. Haylee Ward has published the children’s book Finding Magic In Me and would like to share it. It’s about the healing power of unconditional love – that’s something we can all get behind. Want to read it? Click on through. Literature in Northland, NZ: Who’s writing up north? Exciting new High Spot literary agent Vicki Marsdon appeared at NorthWrite; a queue of hopefuls lined up afterwards to pitch their manuscripts. None of the NorthWrite presenters were Northlanders, which is one failure up here: the region’s writers don’t know each other well enough. There are literary fiction novelists, flash fiction writers, page poets, performance poets and playwrights, but they’re siloed and hardly interact. 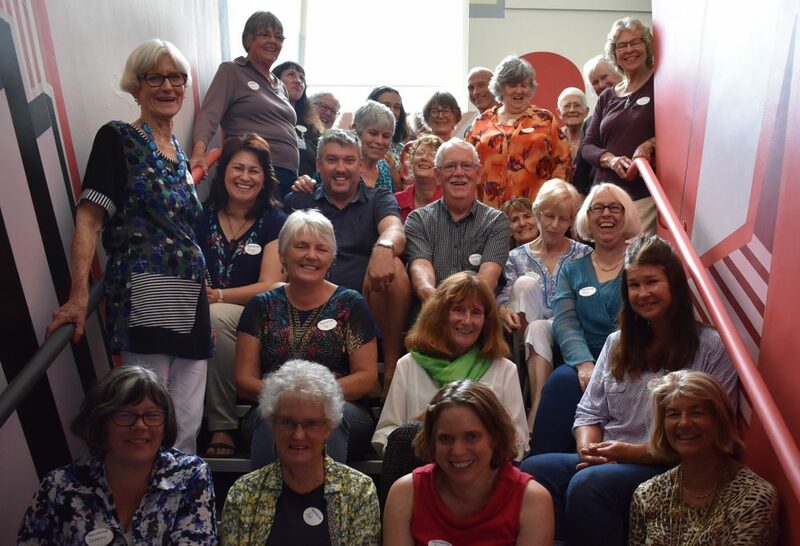 One writer with no need of the NZSA, though is a member, is Kelly Ana Morey, who says that the NZSA, “administer a number of writing grants I wouldn’t say ‘no’ to,’ but admits she’s never been to a meeting. Kelly’s feeling optimistic about her own stuff when I talk to her. She’s excited her 2016 Phar Lap book Daylight Second might find an audience amongst North American horse-lovers when it’s published there by Harper Collins in November. With the weather starting to warm up she’s frantically getting a rough draft up and running before the tradies descend on her once more with their ‘infernal nail guns and Radio Hauraki” so that she can finish the house and sell it. To keep up the pretence of having cash flow she does a little bit of minimum wage waitressing, writes the occasional story for Stuff and does the odd bit of communications for NZ Thoroughbred Racing. Roger Steele once created a writers map of NZ with only Kelly and Hone Tuwhare on it, she recalls. The map’s a whole lot busier these days if you factor in romance writers. Born Daphne Williams in Dargaville in 1939, Daphne de Jong has become one of the most-published novelists in the country, selling nearly 80 titles, all but three of them romance. She’s such a big part of NZ romance writing she has the Daphne Clair de Jong First Kiss Award named after her. She’s also known by the pen names Daphne Clair, Clair Lorel, Laurey Bright and – once – Clarissa Garland. That’s how it works when your books sell hundreds of thousands. Daphne lived most of her life in the dairy town of Maungatapere, west of Whangarei. In 1978, Daphne got her first novel A Streak of Gold published by Mills & Boon and could soon afford to stop working as a librarian. Demand for writers at the time was strong. “During the 80s before the big crash, people were throwing money around – fortunately some of it got thrown in my direction,” Daphne recalls. It took just a few novels before she was attending massive Romance Writers of America conferences and meeting publisher Alan Boon himself. Back in Maungatapere, Daphne got her five kids to help with cooking dinners and ramped up her book production, putting out two 50,000 word manuscripts a year. Daphne says she’s become wary of talking about Mills & Boon “Because people like to make fun of it.” No one’s laughing at the success rate of the writing classes Daphne and friends used to put on in her Maungatapere home, however. They called it The Kara Veer School of Writing; the most successful graduate was Bay of Islands romance writer Fiona Gillibrand aka Fiona Brand. Flash sells nothing, but people go crazy for it anyway. Plenty of writers Bay of Island writers drive 80 minutes down to Whangarei for flash meetings where they hunch over a table in the public library. Some of the first proponents of the 2012 flash phenomenon were Northlanders. Flash took off nationwide after occasional-Whangareian Michelle Elvy and friends published the first Flash Frontier magazine in 2012 (Michelle has most recently been living on a boat in Tanzania, but has come back to NZ to launch Canterbury University Press’s 2018 Bonsai: small fictions). If you can publish from a boat in Tanzania, you can publish from anywhere – including Ruawai, a bend-in-the-road town 30 minutes south of Dargaville. There, Wild Side Publishing is becoming a pretty big deal. WSP took off in 2014 after meth memoirist Janet Balcombe met Ray Curle at a book convention. The two married soon after; WSP was their baby. Janet’s book The Wild Side was toured around the country from 2015 to 2018. Shortlisted for the Ashton Wylie Awards 2015, Janet’s memoir remains the company’s biggest seller and has helped sustain WSP. Ray brought to the company marketing experience from his background with Radio Hauraki and Christian Life magazine; Janet has done much of the writing of WSP’s best-sellers. Wild Side now distributes 45 titles and has published ten, primarily in the Christian publishing niche. “They’re mostly memoir, and all inspirational,” Ray tells me. Not far from Ruawai you’ll find poet Sam Hunt. I caught him on the phone briefly between chopping kindling and doing interviews with mags like New Zealand Listener, promotion his new Potton & Burton poetry collection entitled coming to it (lower case, Sam tells me, though it doesn’t look that way on the cover). Sam, 72, begins in a cheery mood, having had some good medical news that morning. Having a journalist phone to ask him about his place in Northland writing kills his buzz, though. Piet names Riemke Ensing (Dargaville), Stu Bagby (Te Kopuru) Peter Dane (Russell) and Kendrick Smithyman (also Te Kopuru) as notable poets from up north. Northland has a population of 180,000 people and just one town with more than 10,000 peeps. There are few groups and movements, but tonnes of solo people doing solo stuff. Kerikeri’s Bianca Staines has won two Purple Dragonfly Awards for Children’s Books; NorthTec creative writing head Dr Zana Bell has published six romance and young adult books; Peri Hoskins got his second memoir a bestseller on Amazon; and I’ll get told off if I don’t mention Diana Menefy, who has had success publishing young adult historical fiction through Scholastic and One Tree Press. So yeah, nah, Northland’s got heaps, bro, heaps – but apparently not Sam Hunt. Kia ora Koutou – it was exciting to spend the day at the Hokianga Book Festival on Saturday . Rawene was a true bibliophiles’ paradise with every interest attended to, from poetry and publishing, to illustration. We were proud to host Susy Pointon’s book launch and the Self-Publishing workshop run by Janine McVeagh, and were especially pleased to run the Far North Essay Competition , Small is Beautiful, whose prizes were announced on the day. Thanks to our judge Dr Cathy Gunn, Associate Prof of Higher Ed at the University of Auckland, currently enrolled on the Masters of Creative Writing course at AUT and self-confessed bookaholic. Six finalists were chosen whose works will feature in a publication to be released before Christmas: Janine McVeagh, Seabourne Rust, Mike Bracey, Chelsea Karl, Sandy Myhre and Mark Carey. Of these writers a single winner was to be c hosen but Cathy found it impossible to decide between two essays, each outstanding in their originality. One lyrical, poignant and self-reflecting, the other sophisticated, astute and incisive. The awards were made to Mark Carey and Chelsea Karl. Check our Facebook page https://www.facebook.com/No1Parnell for the award ceremony. A mouse’s tale with a twist. This is the story about a boy and his pet mouse. It is a heart warming yet slightly naughty book which is sure to amuse kids! Lesley Curnow is a novelist and short story writer, who lives and works in Kohukohu. The following info is from Lesley’s website. Born in Hong Kong, her family emigrated to New Zealand when she was eight. She was brought up in Whangarei. In 2001 she moved to the Hokianga to study writing with Janine Mcveigh and fell in love with the harbour and its people. 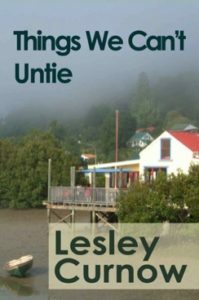 In 2010 she launched her novel “Things We Can’t Untie” A story of the Hokianga, at the Geddes Gallery. She and her husband, Peter, live in the village and apart from trips to visit family across the world plan to grow old here! To contact Lesley send her an lesley.curnow@gmail.com or visit her website. What do you do when your world collapses−when the people you love fail you? Catherine Jennings arrives in a remote New Zealand village hoping to start a new life. But she drags the past with her, plunging Chris, and his wife Anna, into a nightmare of old secrets and sudden death. Both women must unravel their turbulent past before they can turn and face the future. Things We Can’t Untie is a haunting, mysterious book that is difficult to put down. The Novel has been well reviewed by readers on Amazon.com, gaining a four and a half star rating from thirty-three reviews. It is New Year’s Eve and Leah’s Life is falling apart. Her husband, Max, is having multiple affairs and expects her to look the other way. When she confronts him, he leaves her. 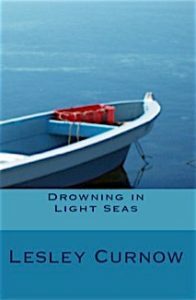 Drowning in Light Seas is a fast-paced, tense novel, which explores the many dimensions of online relationships – openness, trust, friendship, sexuality, power – and how they can affect your life. Lesley’s books are available online from Amazon. The Kindle version of Things We Can’t Untie can be downloaded from the Amazon website for a modest 80 cents (US) and Drowning in Light Seas can also be downloaded from the Amazon website for about the same price. If you don’t have a Kindle ebook reader, there is a free app for just about devices which can be downloaded here. These links will also take you to the print versions of both novels. From Inspiration To Publication – Fiction Writing Crash Course. Delivered by writer Michael Botur. 10am-3pm with two 25 minute breaks. Cost – $45, including writing feedback before and after the workshop. On Saturday September 29 Northland indie author Michael Botur will be delivering a down-to-earth workshop on fiction writing. The workshop looks at how to get fiction writing completed and self-published, in particular looking at the workflow required to get a story polished on the page so you can be confident publishing the work in a literary magazine or online. The workshop covers voice, character, prose and editing. Botur says the bigger theme of the day is understanding that words on the page are just the start, and reaching an audience these days is about capturing inspiration, checking that the words are good enough to publish, then sharing it with the world online. Whangarei-based Botur is author of several acclaimed short story collections and young adult novel ‘Moneyland’ which has gained a cult following on the world’s largest publishing platform for teenagers, Wattpad – a site which has 65 million unique visitors per month. Botur will teach how to put writing straight in the hands of the audience. The workshop will include an introduction to online publishing platforms Medium.com, Smashwords, Createspace, Wattpad, Bookfunnel and Goodreads. Registration is essential – please RSVP to Mike@michaelboturwriter.com. Cost is $45+GST for the day – RSVP by email and Mike will invoice you. Mike will contact you to ask for details about your level of writing experience, and give you some feedback on your writing before and after the workshop.